I’m so sorry for not posting lately. I’ve been a bit distracted since we’ve been in Texas. The last two weeks have been a blur of fun with my husband’s folks. We have ridden bikes, played in the sprinkler, been fishing, shopped at Kohl’s (Yay for jeans that fit! ), hunted Easter eggs (multiple times), watched a reenactment of the Battle of San Jacinto, visited the zoo, eaten Mexican food and more. Needless to say, we have been busy and having so much fun. My nails (and cuticles) have been beaten up and sorely neglected though. I hope you will stick around despite it being a little slow around here. I’m honestly not sure how much I’ll be able to blog in the next 3 months. In fact, what I’ve got to share with you today is something I sported a while back that I haven’t shared yet. But it is cool! I received this polish as a gift from a great family friend who is also a total enabler in the polish addict department, and I really loved wearing it. 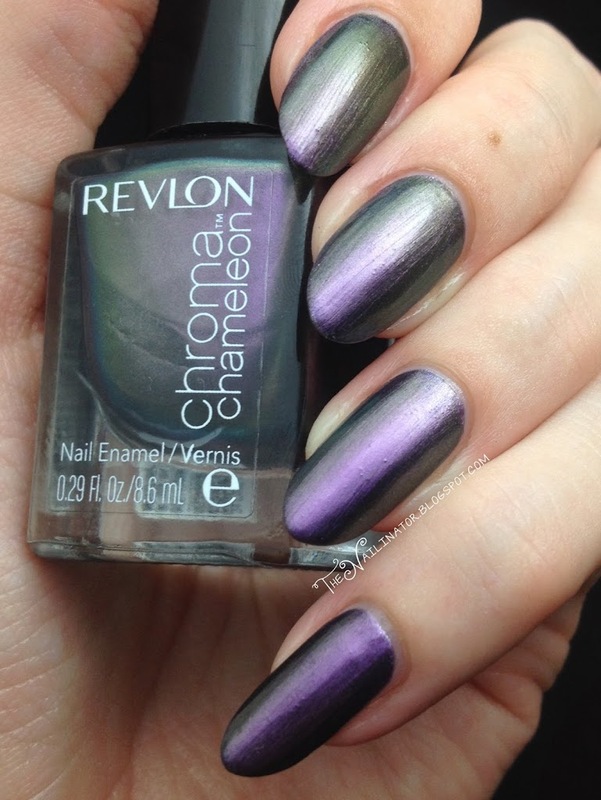 This is 2 coats of Revlon Chroma Chameleon Amethyst over two coats of Caronia Trance. 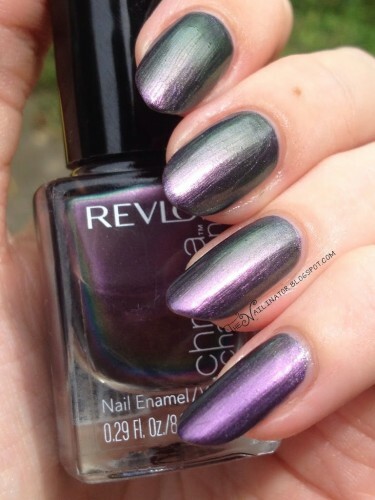 Amethyst is a purple to green duochrome that I don’t think you could really wear on its own. But it is pretty layered over a similar shade. I had great difficulty photographing this polish and capturing the shift. But I hope you can get a decent idea with the awkward pictures I do have to share. The pictures show the brush strokes really bad but they weren’t as obvious in real life. I added stamping with Pueen Love Elements plate 47 and Color Club Harp On It which ended up looking really cool. 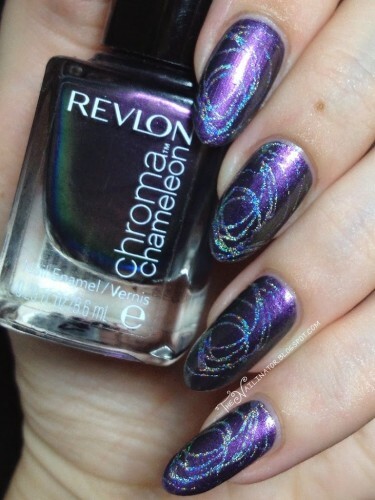 I love holo stamping over dark polishes. Don’t you? The shot above was taken in direct lighting to show off the holo. I received a lot of compliments while wearing this. This is the only polish I have from the Chroma Chameleon line from Revlon. I really like it. I don’t have much experience with duochromes though. What about you? Do you have this one or any of the others? Do you like them? That’s all for me tonight. I’m off to get the kids to bed (fingers crossed) and hopefully polish my nails too (fingers and toes crossed). I hope you have a blessed day or night depending on where you are in this wide world.